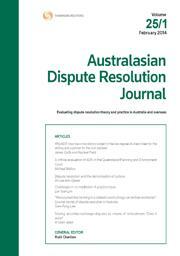 This Special Issue of the ADRJ (Volume 28 Part 1) features a selection of articles based on papers presented at the National Mediation Conference in September 2016 on the Gold Coast. It is the initiative of the Co-Convenors of the National Mediation Conference Board 2016: Mieke Brandon and Callum Campbell. The theme of the conference was “Thought, Innovation and Creativity: The Next Decade”. With over 500 delegates from around the world attending the five-day conference, consisting of lectures, workshops and a research day, the conference was the premiere opportunity for mediation practitioners to convene and share ideas, research and best practice models. The editorial to this Special Issue provides an overview of the conference and the table of contents provides a summary of each article. Click here to obtain a copy of this Special Issue or here for further information about the Australasian Dispute Resolution Journal.